Bears, free negroes and wild cats. 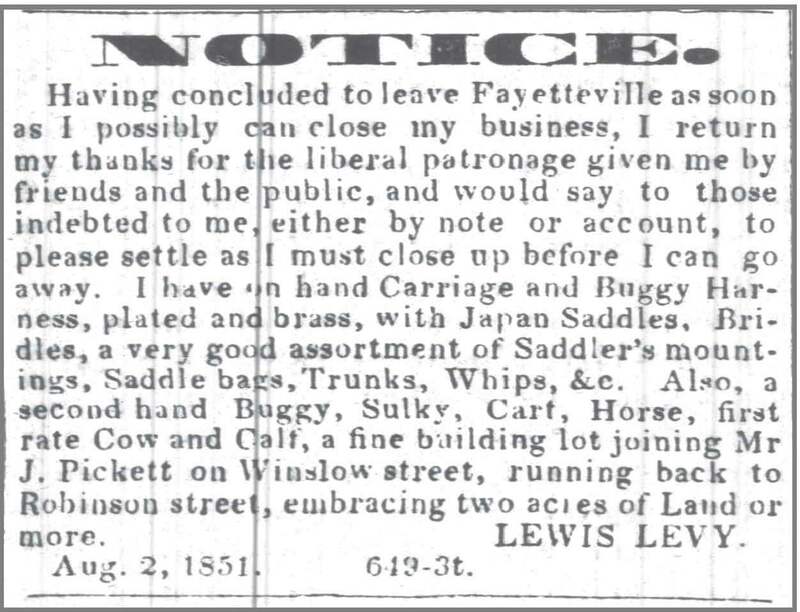 Goldsboro Messenger, 4 February 1886. FIRE. – The alarm of fire last night about 11 o’clock, proceeded from the burning of a frame house in the Eastern portion of the town, North of the Wilmington & Weldon Rail Road. The house was occupied by a free colored man named Wm. Merrick, with his family. We believe Merrick also owned the property. We do not know the exact amount of loss, but suppose it might be between six hundred and eight hundred dollars. 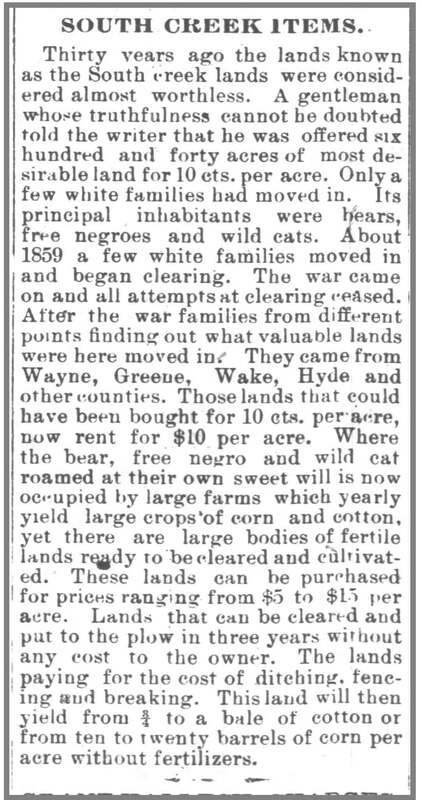 Wilmington Journal, 31 January 1861. Free colored farmers, no. 2. Charles Winn. 125 improved acres, 199 unimproved acres, value $300. Farm implements valued at $50. 3 horses. 4 milch cows. 2 other cattle. 35 swine. Livestock valued at $230. 250 bushels, Indian corn. 8 bushels, oats. 100 lbs., wool. 500 bushels, peas and beans. 50 bushels, Irish potatoes. 400 bushels, sweet potatoes. 365 lbs., butter. Homemade manufactures valued at $75. Adam Winn. 400 improved acres, 1500 unimproved acres, value $3800. Farm implements valued at $100. 6 horses. 6 milch cows. 30 other cattle. 6 asses and mules. 2 oxen. 20 sheep. 60 swine. Livestock valued at $715. 350 bushels, Indian corn. 10 bushels, oats. 70 lbs., wool. 100 bushels, peas and beans. 3 bushels, Irish potatoes. 1000 bushels, sweet potatoes. 450 lbs., butter. Homemade manufactures valued at $42. Levi Winn. 150 improved acres, 236 unimproved acres, value $1500. Farm implements valued at $60. 3 horses. 4 milch cows. 1 oxen. 12 other cattle. 11 sheep. 15 swine. Livestock valued at $300. 200 bushels, Indian corn. 75 bushels, oats. 3 bales, cotton. 45 lbs., wool. 200 bushels, peas and beans. 25 bushels, sweet potatoes. 50 lbs., butter. 5 tons, hay. Homemade manufactures valued at $10. Washington Winn. 50 improved acres, 58 unimproved acres, value $400. Farm implements valued at $25. 1 horse. 2 milch cows. 1 other cattle. 8 swine. Livestock valued at $155. 250 bushels, Indian corn.15 bushels, oats. 15 lbs., wool. 40 lbs., rice. 40 bushels, peas and beans. 40 bushels, Irish potatoes. 50 bushels, sweet potatoes. 100 lbs., butter. 40 lbs., cheese. 3 tons, hay. Homemade manufactures valued at $30. Sally Winn [widow of Gray Winn]. 60 improved acres, 163 unimproved acres, value $500. Farm implements valued at $15. 3 horses. 2 milch cows. 3 other cattle. 10 swine. Livestock valued at $115. 220 bushels, Indian corn. 1 bushel, oats. 25 lbs., wool. 100 bushels, peas and beans. 50 bushels, Irish potatoes. 50 bushels, sweet potatoes. 6 tons, hay. Homemade manufactures valued at $5. Napoleon Road is a bent elbow of a dirt lane running north west of Eureka in Wayne County. At its southern end, it debouches into Reidtown Road, so named for the free colored Reid family who lived in the area as early as the 1830s. 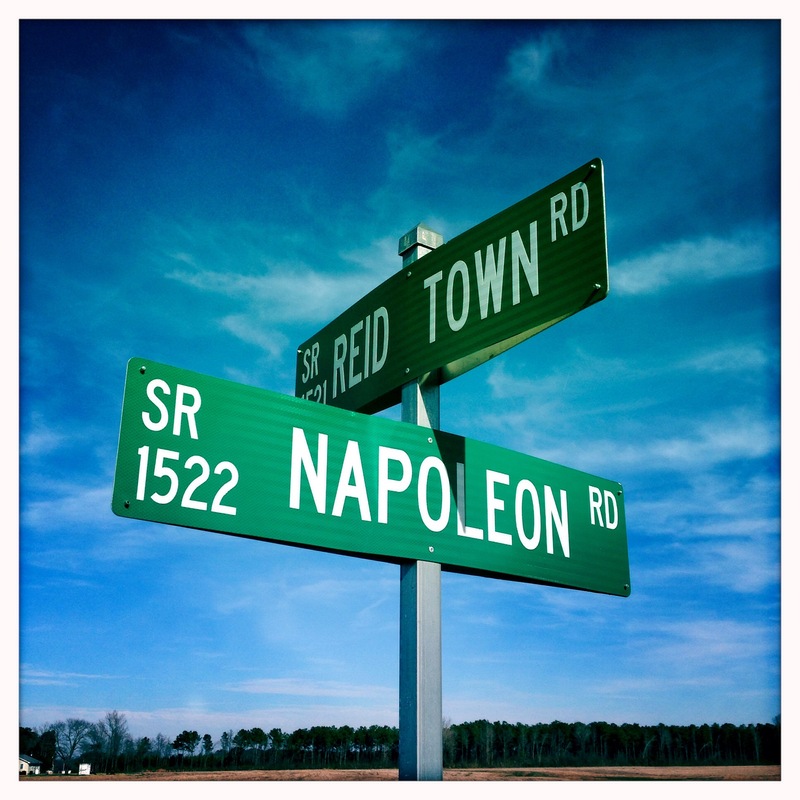 Napoleon Road is no longer than a mile or so, and there is one house on it. Napoleon Hagans built that house. Rural roads did not have formal names until the county implemented its 911 system perhaps 20 years ago. It is a testament to Napoleon Hagans’ stature that, nearly one hundred years after his death and three-quarters of a century after his descendants left the state, the majority landowner along what had been his road chose to memorialize him permanently.